Costa Rica to Panama – 15 Hours by Bus!?? Warning – If you are an impatient person NEVER take the 15 hour bus ride from San Jose, Costa Rica to Panama City, Panama!!! Adios San Jose, it's been real! Trying to figure out my next move in Central America I came upon a fact I should have taken more notice of before I left. It’s the rainy season and even though the weather is still warm and the rain is brief and sporadic, the beaches will probably not look like they did when I was Google Imaging them from home before I left. One potential plan I had was to head to the Caribbean side of Costa Rica then south to Bocas Del Toro for a month of beach living and Spanish classes. However, after looking at the monthly forecast of rain and storms I randomly opted to book a 15 hour overnight bus ride directly to Panama City where I will try to find work as an English Teacher. Walking back to my friend’s house from the Tica Bus station the realization of how long a 15 hour bus ride actually is hit me pretty hard. The longest bus I’ve been on before was 8 hours in SE Asia and pretty much the opposite of awesome so why exactly did I just opt in doubling that pain? One thing I’ve learned from life is don’t regret things or second guess decisions that can’t be changed so I just put it out of my mind. After a box of white wine and saying farewell to my sporadic road trip partner I put on my backpack and the best “Don’t Mess With Me” face and walked 45 minutes across the city of San Jose alone and after dark to catch my 11pm bus. The legendary Tica Bus, Nicer than you would expect! After waiting for the bus for an hour I eventually boarded and passed out hard. I was pleasantly surprised to find out 5 hours had already gone by when the driver woke up all the passengers as we were at the Panamanian border. We lined up outside the empty Costa Rican border control and minutes seemed like hours as I struggled to keep my eyes open. To my horror the minutes actually turned into hours as the line of passengers slowly dispersed to sit on the various dirty concrete stairs around the border control instead of waiting in a long line. After one hour had passed my level of disgruntled was at an all time high, but when hour two went by I thought I must be on a hidden reality TV show called “Disgruntled Explosion!” where the hosts set up unbearable situations to make people crack. As I drastically search for hidden cameras, eventually the employees trickled in just after 6am. I couldn’t understand why the bus would arrive so early if the border didn’t even open until 6am?? What also befuddled me was that this bus ran daily so you think they would have figured out this problem of schedules by now?? Hola Panama! Fancy a Cerveza? 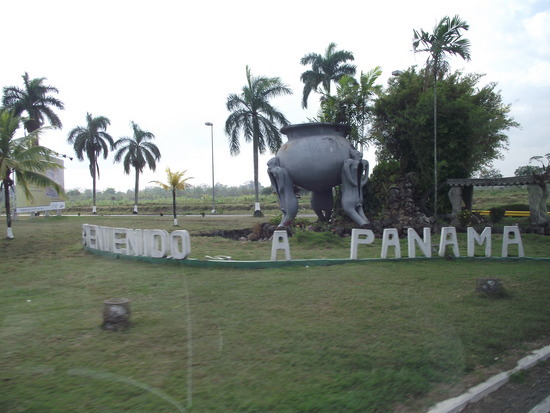 This entry was posted in Panama and tagged Adventure, Border Crossing, Costa Rica, Long Bus Ride, Panama, Panama City, Tica Bus, Travel by verenico. Bookmark the permalink. Sounds like an adventure already! Great reading…! I hope you finally made it off of the bus! Great point too about travel not being this enjoyable holiday 24 hours a day, 7 days a week. I have been in many uncomfortable situations as well, but no one ever asked me about those. They want to hear the favorites, perhaps because to them, the 15 hour bus rides don’t exist. If you ever have a chance to go back to the Caribbean side of CR, Puerto Viejo de Limon is an amazing little town! A bit touristy but the locals are great. I laughed my way through this entire article. I love everything about Latin America, despite how frustrating things can be sometimes. I remember going through Ecuador and Peru on a bus back when I spoke no Spanish. When we finally got to our destination, I had no idea we were there, and wasn’t going to get off the bus, until the guy who had come to pick us up discovered the “gringas” were on the bus and convinced me he was the person who was supposed to pick us up! Such great memories! I have done San Jose to David Panama many times and usually arrive at the border crossing around 6PM and it takes about an hour to get through. 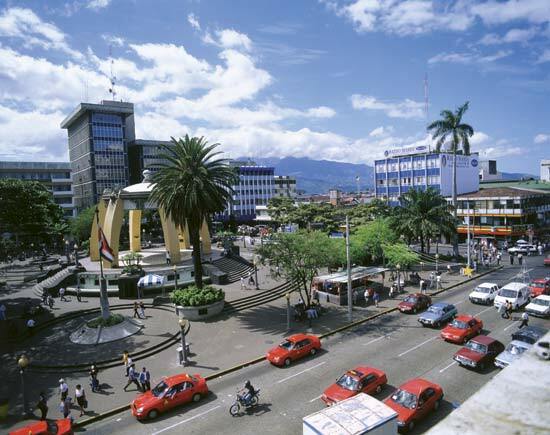 The last time I went to Costa Rica for a border run they turned me away or i had to purchase a ticket San Jose to David..although I wasnt going to San Jose it was comply or go back..just a tip for those going into CR. I own a backpackers hostel in David called Bambu Hostel http://www.bambuhostel.com and we receive a lot of travelers that are going to Panama City but stop and overnight with us before going on..
Oh My God…I could have written this article. I burst out laughing several times, because I swear to God, you and I had the exact same experience, down to details such as the box of wine, the don’t mess with me face, the shock of hours waiting at the border, and searching for the realty TV cameras. I am now facing the return, and I shutter. Plane fares are over 300 one way back, and yet I cannot face another experience like that on the bus. WE WERE AT THE BORDER FOR SEVEN HOURS DOING NOTHING. THE TICO STATION DIDN’T OPEN FOR HOURS AFTER WE GOT THERE AND THERE WAS ONLY ONE PERSON SERVING THE ENTIRE BORDER. WTF????? I am planning on going to David and spending the night, or just finding a gun and shooting myself. Oh yeah, let’s not forget the entertainment on the TICOBUS.. Videos from the early 80’s – that is MUSIC videos, with that awful hair and tight high waisted jeans worn with shirts tucked in and tacky thick belts. And the snacks? Pure gross. Macdonalds hambergers and pepsi. And after I refused and shared the stories of SUPERSIZE ME, I quickly got dirty looks from the locals. I was going to die. Shoot me now. I can’t face that again. The music alone was just horrible. No, I think I’d rather sit in the back of an open truck with farm animals than return to San Jose on the Tica Bus. 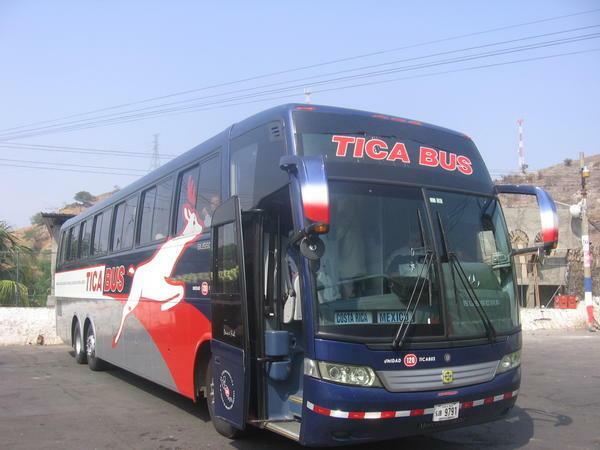 I mean Tica Bus..not Tico Bus…in case someone with GREAT PATIENCE should look them up. The scariest part of this story is that you walked 45 min after dark in San Jose Costa Rica. I have taken the same trip a few times and it has been pretty much just as you described. However,. one of the things you left out was that they provide food just after leaving the boarder. Maybe you had fallen asleep by then. Anyway if you didnt have the chance to eat it was cold rice and beans with a slices of cold fried hot dog. And to enter Panama you will need 1 US dollar besides proof of cash or a credit card.